Chemist Henry Schurkus is the first Outgoing LMU Fellow. With an LMU Research Fellowship in his bag, he will work at the California Institute of Technology in Pasadena. His project could help to make hydrogen production more carbon neutral. Dr Henry Schurkus is working on one of the most challenging problems facing society, albeit in a somewhat indirect way. His expertise lies in the area of theoretical chemistry – more specifically, quantum chemistry, which deals with the behavior of the electrons in atoms and molecules. The questions that Schurkus is currently investigating have to do with the properties of the hydrogen molecule. Hydrogen is widely regarded as the energy source of the future because, in the long term, its exploitation could break our present dependence on fossil fuels such as oil and natural gas and it is relatively easy to store. Unfortunately, most hydrogen is now produced from methane in a reaction that gives rise to carbon monoxide, which readily reacts with water vapor to yield the greenhouse gas carbon dioxide. Schurkus’ theoretical studies could lead to a reaction scheme that reduces the negative impact of hydrogen synthesis on the climate. He has now taken a step toward the realization of this goal. Three weeks ago, he arrived at the California Institute of Technology (Caltech), one of best universities in the world, to begin work on his latest research project. His stay at Caltech is made possible by the Outgoing LMU Research Fellowships Program, which was set up by LMU in 2017. The scheme enables young postdoctoral researchers at LMU to undertake projects at an academic institution of their choice outside the European Union. Henry Schurkus is the first Fellow to embark on such a project. He describes the background to and the goal of his project as follows: “Alternatives to the present method for the production of molecular hydrogen have already been suggested – procedures based on electrolysis, for example. For large-scale industrial production, experiments with various catalysts are underway. I hope to develop a theory that allows the catalytic properties of such agents to be reliably predicted.” This would greatly facilitate the development of effective catalysts. Caltech is not a large institution, but of its 2200 students, over 600 are enrolled in a postdoc program. The 38 Nobel Prizes that have hitherto been awarded to Caltech faculty or alumni speak for themselves. As an LMU Research Fellow, Henry Schurkus can still count on the support of his former PhD supervisor Professor Christian Ochsenfeld. His local academic advisor is Professor Garnet K. Chan. Chan’s research interests focus on correlated quantum phenomena in chemistry and physics. Indeed Schurkus chose to go to Caltech because of Chan. For the methodological advances Chan has made in quantum chemistry serve as the starting point for Schurkus’ approach. 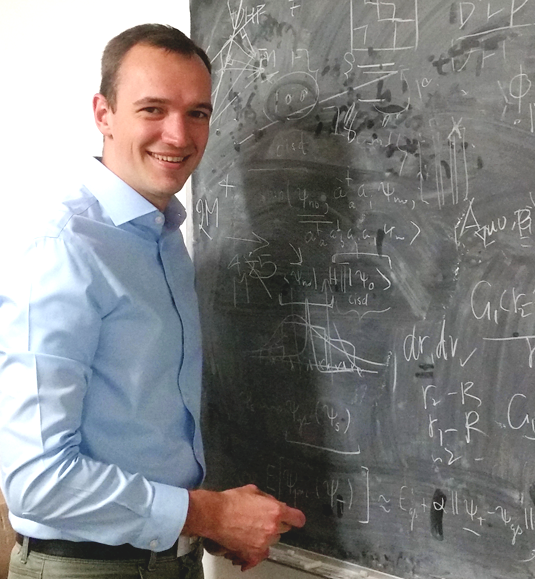 Henry Schurkus is one of the most promising young scientists in his field. He obtained not one, but two Bachelor’s degrees, in Chemistry/Biochemistry and in Physics, in 2012. A Fellow of the Bavarian Elite Academy (Bayerische EliteAkademie), he was admitted to a doctoral program ahead of schedule, having passed the necessary aptitude test with flying colors. He completed his Master’s in Chemistry in 2015 and his doctoral thesis in 2017. As the holder of an LMU Outgoing Research Fellowship, following his 2-year stay at Caltech, he will return to LMU to pursue his research for a further year. Vice-President Dr Sigmund Stintzing is very pleased that an outstanding young researcher like Henry Schurkus is the first Fellow to give the new program a face: "This year, too, we hope for numerous applications from candidates just as qualified as Mr. Schurkus. Having an outstanding doctorate and striving to break new ground in their field of expertise are of course prerequisites." The Incoming Program was inaugurated in 2009 and, in the six rounds since then, 55 Fellowships have been awarded. The Program is designed to allow especially gifted young researchers from abroad to carry out research at LMU for up to 3 years. The Outgoing Program was first advertised in 2017. It is intended to enable highly promising young postdoctoral researchers at LMU to spend up to 2 years doing research at an academic institution outside the European Union, followed by a further year of research on their return to LMU. The current call for applications for LMU Research Fellowships ends on 28.11.2018.